Kevin Duggan is a certified professional dog trainer certified by the Certification Council for Professional Dog Trainers. He has been training professionally for 5 years. Kevin loves working with dogs and helping them mesh better into their homes. He does this by teaching the dog what we would like it to do, and reinforcing the behavior. This is also known as Positive Reinforcement. Kevin specializes in helping build positive relationships between humans and their canine companions. Jumping is a problem that a lot of pet parents deal with. Dogs jump for a couple of reasons. One reason is because the dog is excited. Another reason is because the behavior has a reinforcement history. And one other reason is because our faces omit a lot of smells and the dog wants to get a good whiff. A lot of people get home after a long day of work and get jumped on when they walk through the door. If this is a problem to you, how I recommend remedying this situation is to ask the dog to sit instead of jumping. This is what is referred to as an incompatible behavior. Now, first things first, if you only try this when you walk in the door, and don’t do any practice runs of it, it’ll probably take a while to work. If you go out of your house a couple times a day, and then return and ask your dog to sit, it’ll help him understand what you want when you do it the “real” time. Use food rewards to encourage him to sit in the future. It’ll also be a good idea to have some treats at the ready when you do actually come in on the “real” ones. Stay patient with this, it will take lots of repetition. In the long run, you will not need treats for this, as your attention in this situation is what the dog is after and will serve as the reward. Another game I like to play that helps dogs understand that we want them to sit instead of jump consists of teaching and “auto-sit.” To teach this, I grab a treat and show it to the dog. I then walk to a spot in the room and turn towards the dog. The dog comes up to me and usually tries behaviors that have worked in the past. (Jumping, pawing, barking, etc.) I patiently wait for the dog to offer a sit. Once he sits, I give him a piece of the treat and then I move to another spot and start over. As the dog starts doing well with this, I start moving a little faster to cause a little more excitement. The idea with this is to get the dog in the habit of walking up and sitting in front of people, instead of jumping on them. This consists of tethering the dog to something sturdy. (Maybe the bottom of the couch) The dog being tethered gives you the ability to walk away without him following. Walking away when done correctly is a form of punishment. As soon as the dog takes one paw off the ground, you want to walk away. (You can use this for play biting too.) When you’re hanging out with him you’ll want to give him lots of attention and even food or toy rewards for not jumping. As soon as he jumps, walk away. This is something you’ll want to do for a couple weeks. (Even when the jumping has stopped with you when doing the game.) By continuing you’ll be continue to reinforce the good behaviors. Be very strict with this process. It isn’t the easiest thing to accomplish, but with lots of consistency you’ll have a dog that doesn’t jump on guests coming in the door. Also, don’t allow people to say that jumping on them is okay. This is going to confuse your dog and cause the jumping to continue. If the situation comes up, tell the person your dog needs to sit for greetings. If they can’t respect that, they lose their opportunity to pet your dog. In conclusion, to stop unwanted jumping you need to be very consistent. Don’t allow your dog to jump on guests sometimes. Don’t allow guests to say, “it’s okay, he can jump on me.” Don’t allow the dog to jump on you sometimes. Always ask the dog to do a more appropriate behavior like sitting. If you stay strict, you’ll accomplish your goal. If you get lax, you’ll probably have a dog that jumps for a lot longer than you’d like. Dogs bark. Yes, this is a pretty obvious statement to start off with, but I feel it’s important to point out. This is something that dogs do. I am going to be talking about different ways to curb some of the barking, but always remember that this is a trait of the domesticated dog. There are a couple reasons why dogs bark. In a lot of cases a dog is barking because it either wants something to get closer, or something to get further away. As I’ve listed, there are many reasons why dogs bark. The first thing you need to do to help curb the unwanted barking is to identify what the reasoning is for why it’s happening. Depending on the reasoning, there will be different approaches on how to handle it. 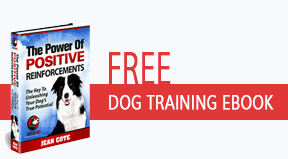 In most cases Positive Reinforcement takes place when the dog barks, which results in more barking. 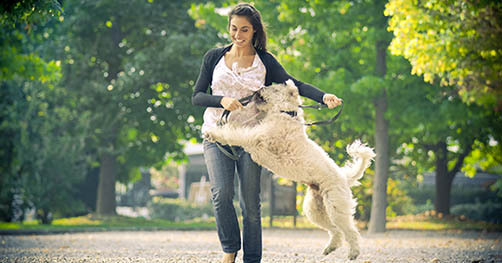 Positive Reinforcement (R+) is when the dog does a behavior, and the behavior gets the dog something it wants. When R+ takes place, the behavior is very likely to repeat. Also, when R+ takes place over and over for that behavior, the behavior often gets stronger and stronger. One of the most important things to do to help curb that unwanted barking is to make sure the dog gets zero enjoyment for the behavior. As I mentioned above, if your dog does the barking and gets what he wants, he will do it again. If he does the barking, and it results in nothing good, the behavior should start to go away on its own. If your dog is barking at you for a treat, and you do not give him a treat, the barking will stop. (It may take some time if the behavior has had a reinforcement history in the past.) If your dog is barking to get someone to go away, and the person doesn’t leave, the dog will learn that barking doesn’t work, and in theory, the barking will stop. If the barking is to get the person to come to them, and the person waits for the barking to stop until coming to the dog, the dog will learn that barking doesn’t make the person come, and actually being quiet will make the person come. These are just a couple examples. The overall idea though is to teach the dog that barking isn’t the answer. Put the bark on cue. This is one that I use quite often. The way I teach this may seem a little counterproductive to start, but it works well in the long run. Here’s how I do it: When the dog is barking, I walk up and say, “quiet” and then present a treat. The dog typically quiets down long enough to just take the treat and then go right back to barking. Do lots of reps of this. I want the dog to start to associate the word “quiet” with getting a treat. After you do enough reps, when your dog is barking, you’ll be able to say, “quiet” and your dog will stop barking and look at you in anticipation of getting that treat. This is the behavior we are looking for. Once your dog responds to the quiet cue, you then want to start asking your dog to be quiet for longer periods before giving the treat. The overall goal is to be able to say, “quiet” and have your dog stop barking. You’ll need to do lots of repetition with lots of reinforcement to make this work. Teach him to use his nose! Make him work for his food or treats! You can also work on regular manners / obedience training. This basically means that you’re preventing your dog from doing the unwanted behavior while you’re not present. If barking out of the window is the problem, you’d want to either utilize a crate, or block the windows while you aren’t there. If your dog is barking while it is outside, either be out there with him, or don’t let him outside by himself. If your dog is barking because he’s frustrated, lower the criteria. The things I’ve mentioned above are some ways to help you achieve your goal of less barking. If you are dealing with fear or anxiety that takes a bit more work than what I mentioned above. 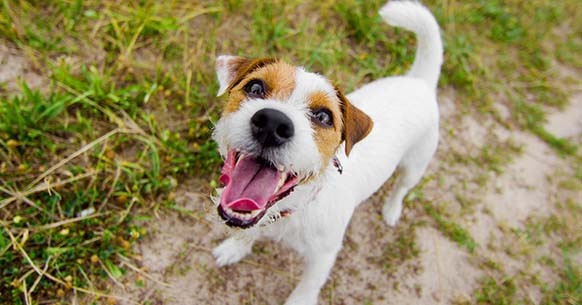 Give some of the ideas a try to get your dog’s barking to decrease. Be very consistent and give lots of reinforcement.